Corned beef and cabbage was always a favorite childhood comfort food of mine, a dish my mom still makes at least three or four times a year, and one that she learned from her own parents. It’s cheap (if the corned beef is on sale), easy, and goes a long way. We kids usually make a regular pilgrimage to mom and dad’s house when we know mom is making it, and even the grand kids love it. 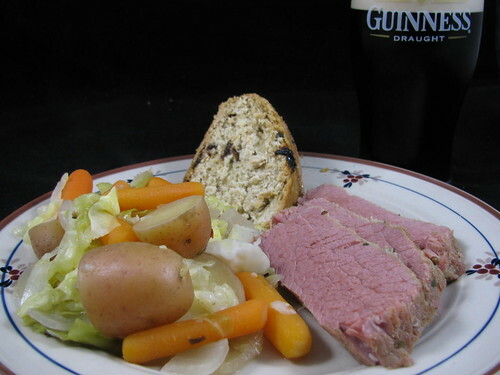 A few years ago, I decided that I didn’t want to have to keep wrestling leftover corned beef and cabbage away from the rest of the family, so I decided to learn how to make my mom’s tried and true recipe myself. I called her up, pen and paper in hand, ready to record this prized family recipe only to learn there is no such thing. Much to my surprise (particularly since I am a genealogist), there is no Flanagan or Hayes recipe that’s been passed down through the generations. Mom, like her own mom did, simply follows the recipe on the back of the corned beef package label. So, this is my version of the dish. Unaltered from the package label recipe, except that I make mine in a slow cooker for convenience. It turns out just as good, but I benefit from being able to cook it, unattended, while I am at work all day. And I get to come home from work and walk into a house that smells absolutely wonderful! Mom and I both stock up on corned beef when it goes on sale around St. Paddy’s Day and freeze for later use. That way, we can enjoy the dish at a modest price throughout the year. Once cooked, we both like to freeze any leftovers in individual portions to enjoy later for lunches. Step 1: Add potatoes, baby carrots and chopped onions to slow cooker. Ste 2: Place corned beef on top of vegetables. Step 3: Sprinkle with seasonings and cover with water. Step 4: With 1 hour left, add cabbage and cook until tender. Enjoy it in big slices, with the potatoes, cabbage, and carrots (and Irish soda bread) on the side. With a Guinness! Or enjoy it shredded up. Weight Watchers Info: 7 PointsPlus per serving (@8 servings), Diabetes Carbs: 14g, Net Carbs: 12g. Layer the carrots, potatoes and onion on the bottom of a large slow cooker. Place corned beef on top of vegetables, then add water. Sprinkle all over with the seasoning packet that comes with the corned beef, and sprinkle with freshly ground pepper according to your taste (I never add additional salt, the seasoning packet is salty enough for me). Place lid on slow cooker and cook on low for 8-9 hours. About 1 hour prior to serving, add the cabbage, and additional water if needed, continue cooking on low until cabbage is tender. Use a slotted spoon to remove corned beef and vegetables from the pot. Shred corned beef with two forks, it will be tender enough to pretty much just fall apart. 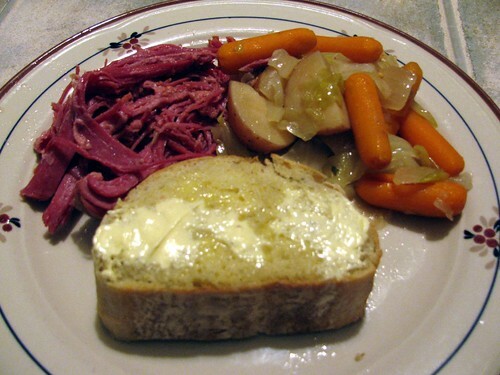 Dish the corned beef, carrots, potatoes, and cabbage on to each plate, and serve with warm crusty bread and butter.